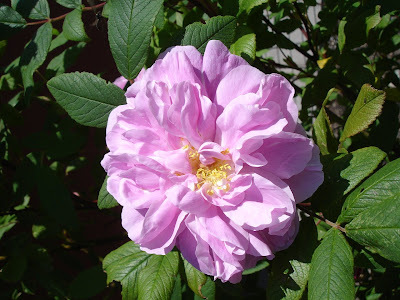 The Far North Garden: Which Hardy Roses Should I Grow? Which Hardy Roses Should I Grow? I have only recently entered the world of rose growers with the addition of 'Foxi Pavement' to my garden. However, there is plenty of literature available to help new rose-growers pick a variety that is hardy, disease-resistant and beautiful. Hardy Roses: A Practical Guide To Varieties And Techniques , by Robert Osborne, is a particularly useful source with details (lacking only height and width) about most hardy rose varieties, including very good pictures for the author's favourites. When it comes to hardy shrub roses, two Canadian series are generally recommended: the Explorer series and the Parkland series. Most of the varieties in these two series are hardy to at least zone 3, although some of them will suffer winter dieback. They are usually grown on their own roots, so they will grow and flower from the roots even if much of the growth is killed during a cold winter. The Parkland roses generally have beautiful flowers and good cold hardiness, but many of them are somewhat susceptible to disease, especially the earlier-released cultivars. Most of these varieties have names beginning with Morden, the name of the research station in Manitoba where much of the breeding work was done. 'Morden Sunrise', with its unusual yellow-orange colour, 'Morden Centennial', with its fragrant, double pink flowers, and 'Hope for Humanity', with its deep red double flowers, are some of the most disease-resistant and popular varieties. 'Morden Belle' is a recent release which is supposed to be similar to 'Morden Centennial', but with better disease resistance. The above-mentioned varieties will repeat their bloom through the summer. More disease resistant than the Parkland series is the Explorer series, which are named after Canadian explorers. If the rose's name sounds like your local Elementary school's name, it is probably from this series. Most are quite hardy, but some, like 'Champlain', 'J. P. Connell', 'John Franklin' and 'Quadra', will either need extra protection in cold areas (zone 3 or less) or will have some dieback. There are many exceptional varieties in this series, including the following cultivars which are all both fragrant and continuous blooming: 'Alexander Mackenzie', with double red flowers, 'Charles Albanel', a low-growing plant with semi-double red flowers, 'David Thompson', with double deep pink flowers, 'John Davis', with double pink flowers, 'Martin Frobisher', with small, light pink, double and very fragrant flowers on reddish stems with few prickles, 'Henry Hudson', with double white flowers, and 'Jens Munk', a double pink rose. This series also includes two popular roses which can be grown as climbers: 'John Cabot' with double, red flowers, and 'William Baffin' with semi-double, deep pink clusters of flowers; these two varieties bloom continuously but are not very fragrant. Another series of hardy roses which is sometimes forgotten is the German 'Pavement' series. These roses are hardy, low-growing, and salt tolerant, perfect for growing by a sidewalk (or pavement). They are all repeat bloomers and very fragrant, with semi-double blooms of varying colours. Other roses of note are 'Hansa', a repeat bloomer introduced in 1905 with good disease resistance and very fragrant, double mauve blooms; 'Marie Bugnet' with fragrant, double white flowers and 'Therese Bugnet' with fragrant double pink flowers and few thorns, 'Agnes', a hardy, fragrant, double yellow rose with good disease resistance, 'Blanc Double de Coubert', with very fragrant, semi-double white flowers, 'Dart's Dash', a continuous bloomer with very fragrant, semi-double mauve-pink flowers and a good crop of hips, 'Schneezwerg', with very fragrant, white, semi-double flowers that bloom continuously, and 'Polstjarnan' (or 'The Polar Star'), a single, white climber that can get as tall as 18 feet. With so many beautiful, hardy and disease-resistant varieties available, almost anyone should be able to find a rose bush that suits them. If you want to be sure about what you are getting, try to shop while the bushes are blooming. What kind of extra protection does it mention for the John Franklin roses? I planted 4 of them this season. BTW, this must be some kind of special book, the price on Amazon was very steep. I don't know why the book is so expensive on Amazon, unless it is out of print or something. But it is available at the Edmonton Public Library for free! I will post about protecting your rose over the winter - it got too long for a comment. Glad to know its at the EPL. I'll reserve it.